Stay tuned for upcoming events for Kinnaird Music Fest in near future. 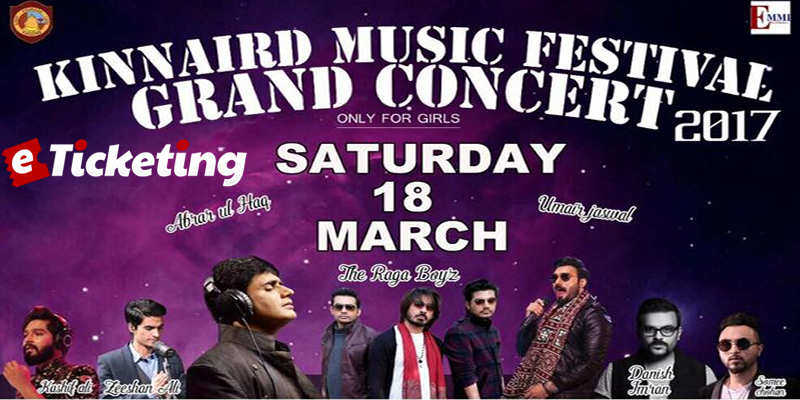 Kinnaird Music Fest is a music festival which takes place at Kinnaird College for Women in Lahore. Kinnaird Music Fest 2017 will be held on 18 March 2017. Abrar ul Haq, Umair Jaswal, Raga Boyz, Zeeshan Ali and Somi Chohan will perform live on the Kinnaird Music Fest Grand Concert 2017. Elite Media Management International are the organizers of the Kinnaird Music Fest 2017. This concert will be highly organized and will provide top quality entertainment. Dhol performance, Dance performance and much more Entertainment acts will be presented. Note: Event is Only for Girls! Elite media management company that caters to the needs of both individuals and organisations in the promotion of theirs brands and media coverage. Terms & Conditions : All rights are reserved by event organizers. Best Viewed at 1024 x 768 pixels and above. This Page loaded in 0.09624 seconds on Tue, Apr 23, 2019 (13:06).